Recently, I had the opportunity to fly to Toronto and film a short segment on the cooking show “In the Kitch” with Chef Roger Mooking. Roger is a self professed “third generation food freak”, an author, official Chef for the Marilyn Denis Show, AND a recording artist! Roger has a very diverse set of skills, talents and interests! Do you know what else is diverse? Corn! And guess what Roger and I were cooking on the show? Corn pancakes! 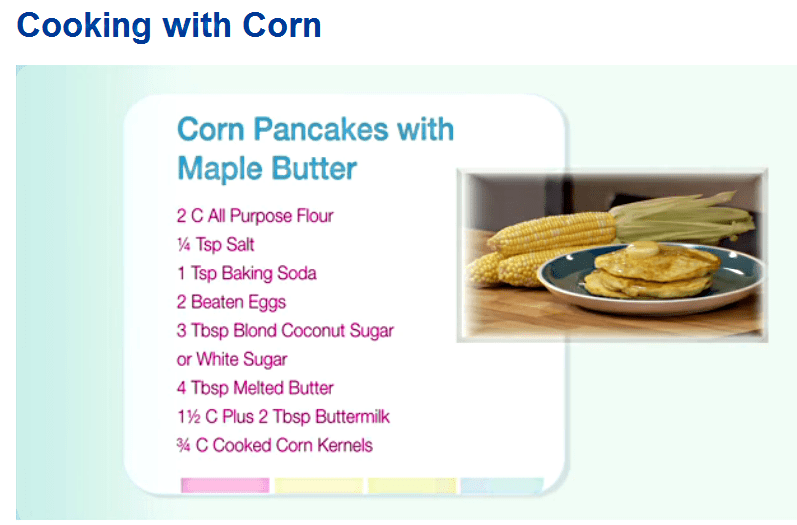 With my help, Roger whipped up some yummy buttermilk corn pancakes with whipped maple butter and and I “talked corn” – corn diversity, production, value, and the technologies used to develop this very important crop. Click here to link to Better Living TV and “In the Kitch” to see this episode. I had such a great time! Thanks to Roger, the crew at Better Living TV, and CropLife Canada for the great experience! Check it out! Share it! Here’s the recipe! It will be aired soon on the Food Network (Sat. July 6th @ 8:30am (EST)/Sun. Aug 25th @ 8:30am).